Sometimes people ask me if I am worried that two different types of training might confuse my dog. They want to know if it happens that my dog suddenly doesn’t know what to do. 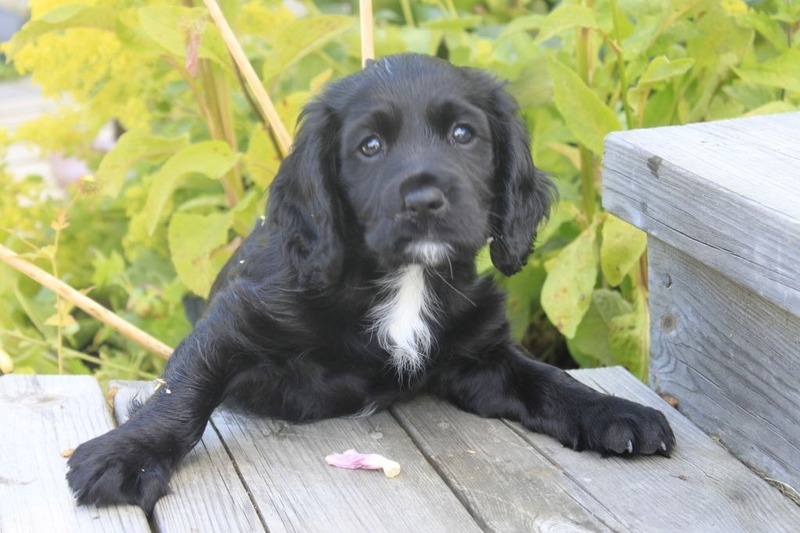 I do both obedience and gun dog training with my Cocker Spaniel Tassla. For a long time I thought that these two types of training only reinforced each other. 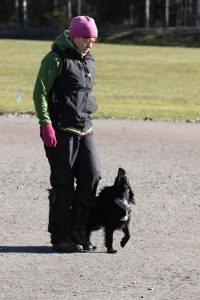 It was for example not very difficult for Tassla to learn the two different types of heelwork – one for gun dog work and one for obedience training. 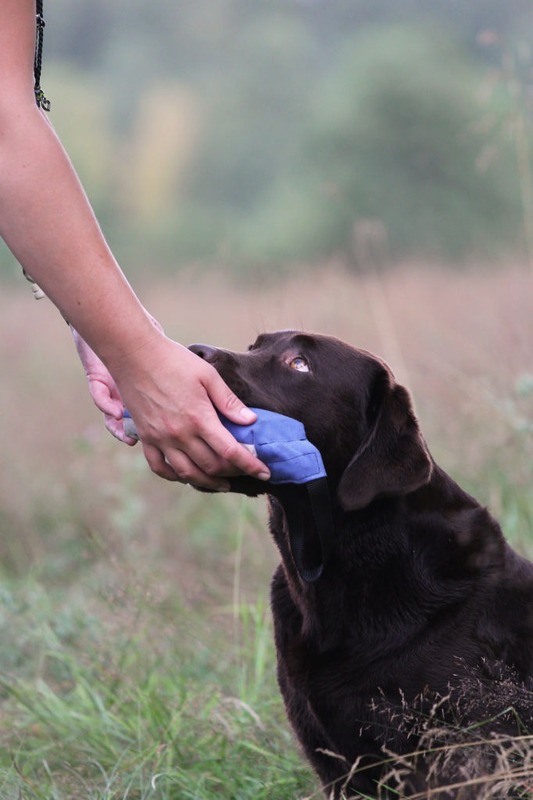 In the obedience work the level of perfection is almost neurotically high as the dog has to be glued to the handler’s side without squeezing the handler and without changing the position one millimeter, and in addition, the dog should have his eyes fixed on handler at all times. 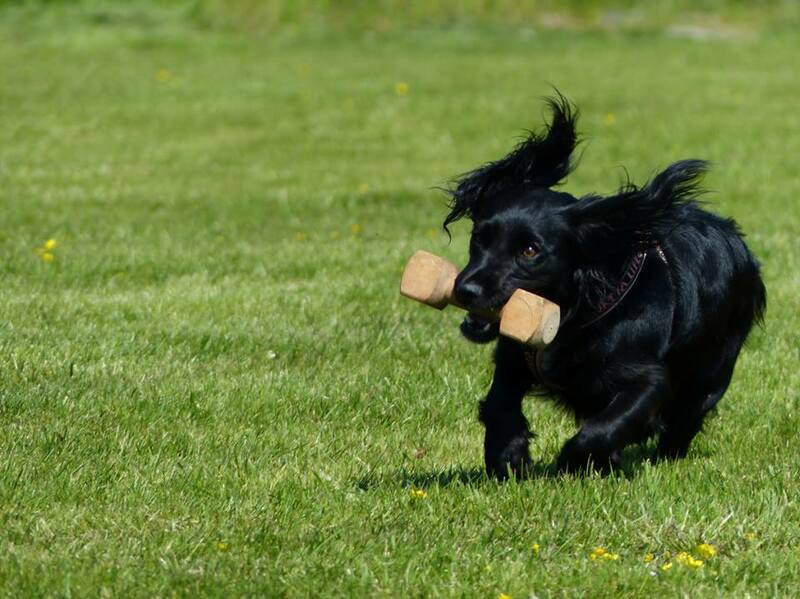 It was very easy to teach Tassla the type heelwork that is required when we hunt because it doesn’t have to be as perfect (for spaniels it is not as fussy as it is for retrievers). “But the dog is not supposed to walk around and stare at you all the time during hunting”, somebody might object. No, that is correct, but I can promise you one thing: That is not the case. When we train heelwork Tassla might sometimes look up at me, but when we are out in the forest and it is time for hunting my little dog is fully focused towards the field. Dogs learn extremely quickly where the fun is going to take place! As a result, the heelwork that Tassla learned during the obedience training helped her learn heelwork used during gun dog training because she had already received so many rewards for walking glued to my side. 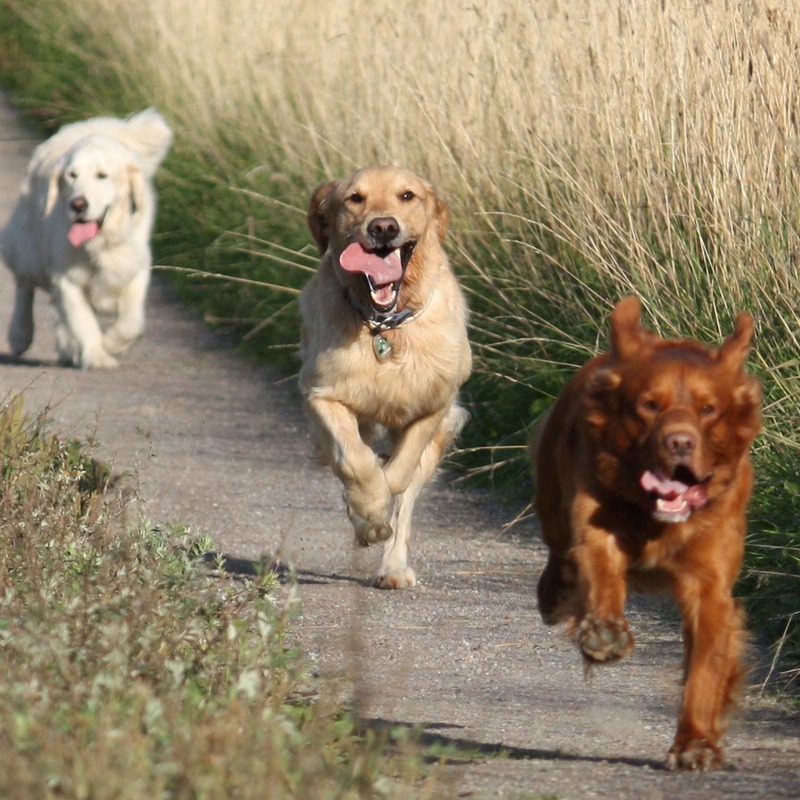 The training of blind retrieves is an example of the opposite though – the gun dog training can reinforce the obedience training. 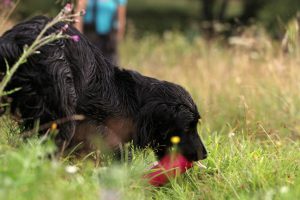 When I started to teach Tassla to fetch directional retrieves during the obedience training, we had already made some progress with blind retrieves in the gun dog training. Therefore, it was very easy to get her to run to the left or to the right, even if movements of the handler’s body must be very small in the obedience training (you are for instance not allowed to move your feet when you direct your dog). To send Tassla in different directions was very easy because we had already practiced that in the gun dog training. But this was also the first time Tassla was confused! When I taught Tassla that she always should ignore the retrieve in the middle I did a lot of proofing. I put a whole bunch of toys at the same spot as the retrieve in the middle and moved it a lot closer to her then the other retrieves and I rewarded her a lot when she ignored the pile of toys in the middle and ran either to the retrieve to the left or to the right, that is to say the retrieve I directed her to. Since Tassla was accustomed to proofing (which means to ignore temptations and instead do what I want her to do and the right behavior leads to a lot of rewards) she understood quite quickly that she shouldn’t care about the retrieve in the middle. 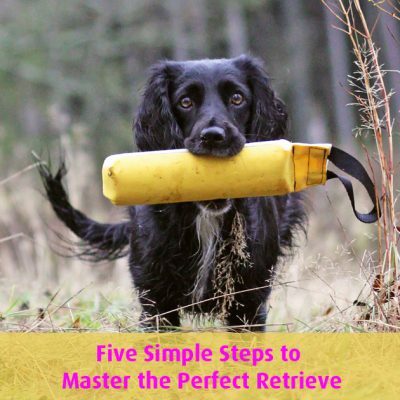 But sometimes she started to run towards the retrieve in the middle, but then I stopped her rapidly and rewarded her for stopping so abruptly (she can stop one inch from the dummy without taking it) and sent her to the accurate retrieve. This meant that she thought that she never should fetch the retrieve right behind us. 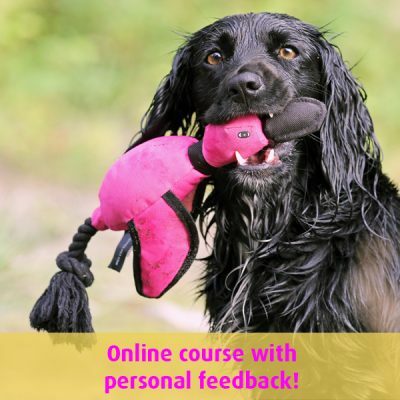 That is correct behavior in the obedience training – but what happens in the gun dog training? After I trained a lot of obedience and no hunting for a long time I decided to train blind retrieves. I taught Tassla to turn around and run straight out behind her to retrieve whatever might turn up, this is usually called a push back. For once I was on an ordinary lawn, where I usually train obedience, and not out in the woods or on a field. This time Tassla either ran right across the dummy or veered a little in front of it (the dummy was fully visible) and then she ran to the right or to the left. In her world, this was exactly the right thing to do. Good dog! I made the training easier and directed her to the dummy when she was turned against it at a distance of one yard. When she took the dummy I gave her a lot of tidbits, threw the dummy one yard ahead, turned Tassla so she stood with her back towards it and asked her to fetch it and she took it right away and I gave her loads of rewards again. Then I increased the distance between the dog and dummy and me and “pushed” her back again. No problem, she took the dummy. Then I went home and I had something new to think about. A few days later, I went out in a field, where we usually train hunt work, and did the same exercise, and she took the dummy straight behind her every time I asked her. The obedience work also went well and she didn’t make any mistakes. The environment is a signal for what we are going to train. At this point Tassla wasn’t totally sure about these two exercises and therefore the disturbance – that she trained in the “wrong” environment – made it too difficult for her. But it doesn’t matter! The only thing you have to do is to train both exercises more so that the dog is completely sure about what to do. The exercises are actually quite different when it comes to my signals – my cues and body movements – and when Tassla knows the difference between the two I will train in the “wrong” environment again. It is good to test that she really understands my instructions. My conclusion is that I am not worried about my dog being confused. The important thing is that I teach my dog everything so that she always understands what I mean. If she mixes different exercises it only shows that I haven’t taught it to her well enough. I just have to practice more – and better! what cues do you use for the direction send outs at obedience? Do you use a different word for left and right? 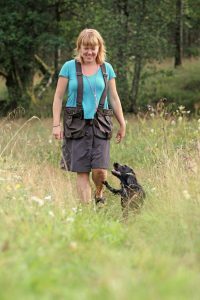 Do you use the same words in gundog work for left and right back? For the send out we use different cues because it’s more of a target behavior. 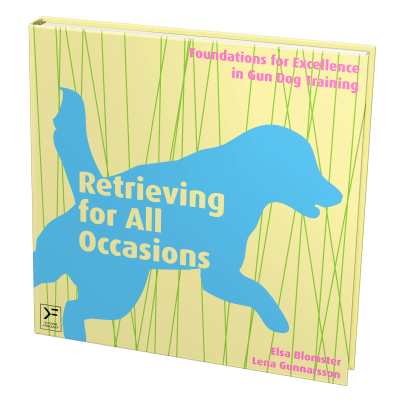 In the initial classes we send the dog directly to a square formed of cones, then we use a Swedish word meaning “square” – “rutan”. Later on the dog should first be sent to a cone, then we use the word “cone” – “konen”. We do use the same verbal cue for left and right “vänster”/”höger” in Swedish, but in obedience the hand signal can’t be longer than the verbal cue and we can’t move so the hand signal is shorter. The dogs learn the difference due to the settings being different. In obedience it’s always the same distance and angle to run and on a flat surface.